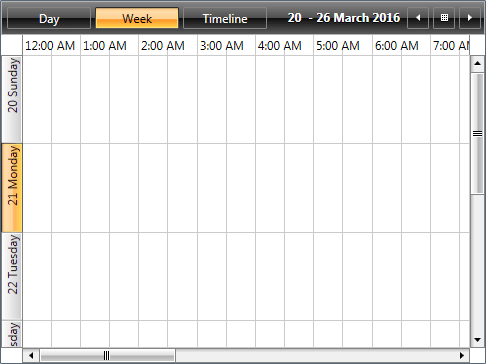 RadScheduleView's four predefined ViewDefinitions have various properties, which can be set in order the views to be configured best. Some of them are common for all views, others are specific for each view. In the following section we will go through all common properties. For more information about the view specific properties, check here. The property is of type DateTimeInterval. In the following example the LargeChangeInterval property of DayView is set to 2 days and of MonthView is set of 2 months and 4 days. Setting the SmallChangeInterval property of a DayViewDefiniton and WeekViewDefinition won’t change the behavior of the view. That is due to that using the vertical scrollbar will not navigate to the next set of days, but will scroll the current view. Gets or sets the time used to indicate the start of the TimeRuler. 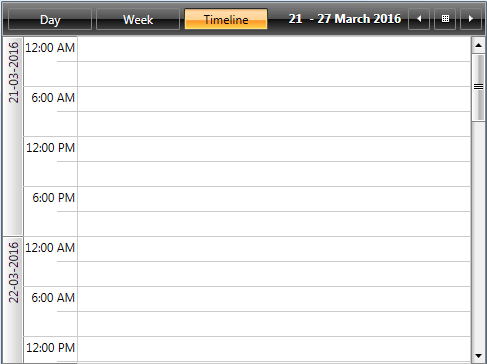 The default value of the DayStartTime for all views is 00:00:00 or 12:00 AM. The DayStartTime is of type TimeSpan. It will not affect the look of the MonthView, since MonthView does not display time. The DayEndTime property is of type TimeSpan. The MonthView will be affected in the following manner – if there are appointments out of the displayed time range, they won’t be displayed in the MonthView also. 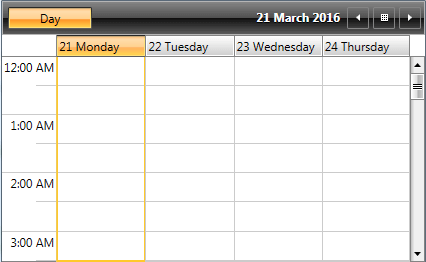 Gets or sets the first weekday with which the week will start according to the view. It affects only the WeekView and MonthView. 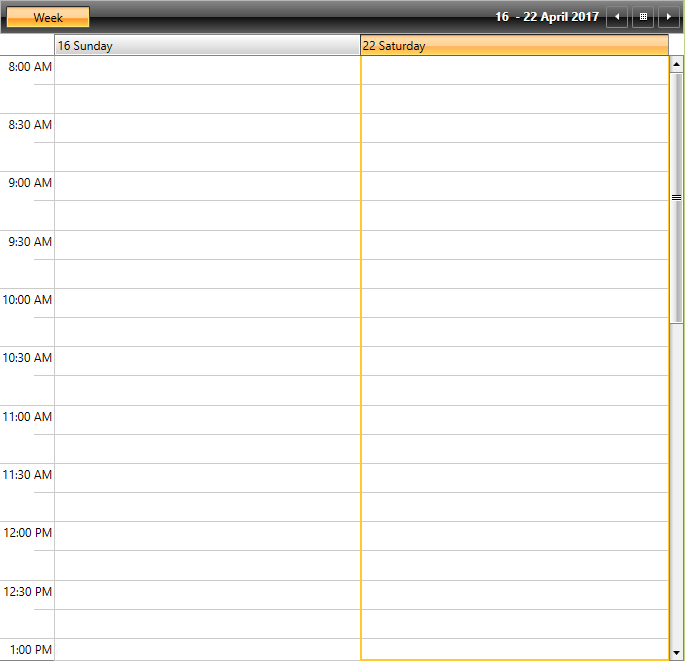 Once set, it will override the FirstDayOfWeek property of the ScheduleView and the one that is default for the culture. If set to True (default value) and there is more available space in the ViewDefintion left, it will be distributed among the groups. Gets or sets the orientation of the view. When the orientation is horizontal the TimeRuler is also horizontally oriented, but the GroupHeaders are oriented vertically and vice versa. DayView with Orientation property set to Horizontal. WeekView with Orientation property set to Horizontal. 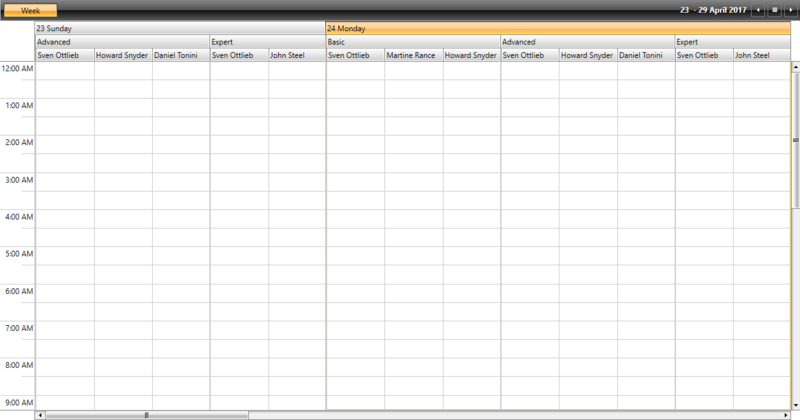 TimelineView with Orientation property set to Vertical. The GroupFilter property can be used when in a grouped scenario a given group needs to be excluded. It is a predicate that takes a given group as a parameter and returns a boolean value determining whether the group should take part in the grouping operation or not. 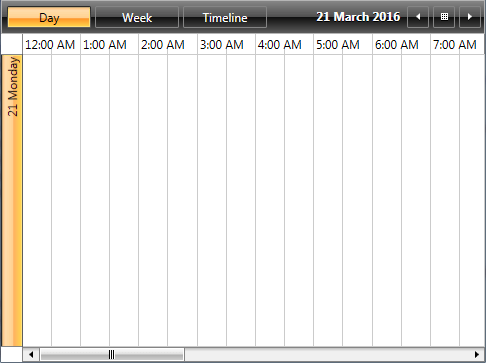 The following example demonstrates how RadScheduleView can display only weekends or only working days through its GroupFilter. As of R2 2017 RadScheduleView exposes the SubGroupsFilter mechanism. It provides the option to control whether a given item should be visible in a particular group or not. The following example demonstrates how RadScheduleView can be populated with some sample Resources and how they can be visualized in a given group and hidden in another. // John Steel has only Expert level subjects. // Howard Snyder has only Basic and Advanced level subjects. // Martine Rance has only Basic level subjects. // Daniel Tonini has only Advanced level subjects. // Hide the Advanced subgroup for the days that have no advanced subjects.